NeoUltra Retrieval Solution is a 3-in-1 pretreatment and antigen retrieval system intended for use in immunohistochemistry. This reagent is designed to deparaffinise, rehydrate and unmask (HIER) formalin-fixed, paraffin-embedded (FFPE) tissue sections in one simple step prior to IHC staining usin Neo Biotech IHC detection systems. This reagent can also be used as a conventional antigen retrieval buffer following traditional deparaffinization / hydration methods. NeoUltra 3-in-1 Retrieval solution improves detection of Ki-67. 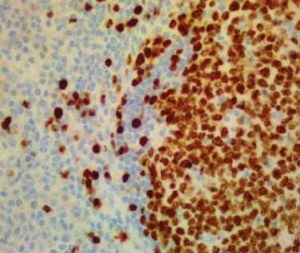 IHC images show the detection of Ki-67 in FFPE human tonsil sections following incubation of tissue for 15 minutes using a pressure cooker in the specified antigen retrieval solution. Compared to 10 mM Citrate Buffer pH 6.0 and 1 mM EDTA Buffer pH 8.0, Ki-67 detection was enhanced following incubation in our NeoUltra Retrieval solution. Ki-67 was detected using Anti-human Ki-67 mouse monoclonal antibody (Clone UMAB 107).